Someday Photo: Declan Brennan - Clogheen, Ireland | Ed Foster Jr.
October 10, 2012 | Ed Foster Jr. 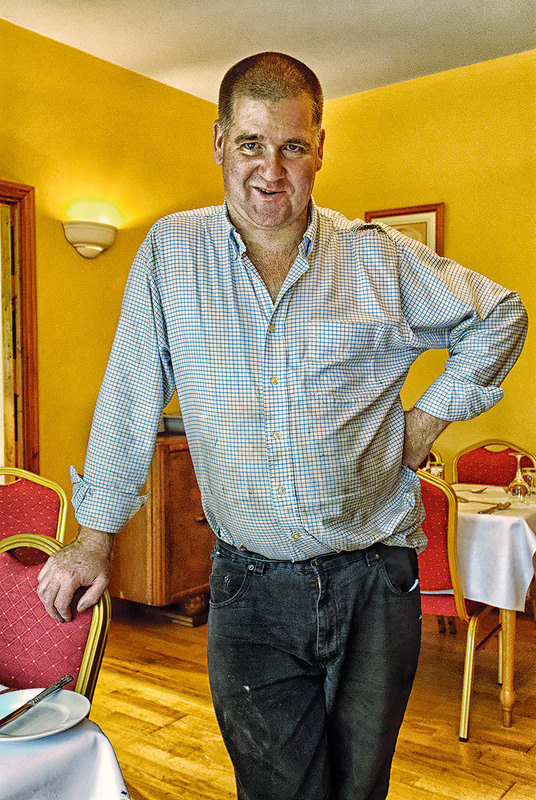 In the morning, Hermitage House host, Declan Brennan, can be found pursuing chores on the grounds of his bed and breakfast in Clogheen, County Tipperary, Ireland. By late afternoon he is freshly scrubbed and sports a crisp white shirt and black slacks and heads to the pub where he holds court until midnight. A few years prior to my stay at the Hermitage House in Ireland, Declan Brennan and his wife Breda shucked their executive attire and acquired an ailing bed and breakfast in her wee home village of Clogheen, County Tipperary. Just a short walk from where she was raised on the banks of the River Tar, they saw potential and a lot of work. But they were not deterred. They had a dream. The couple went about making renovations with a personal touch that included six guest rooms, a new kitchen and the small pub where Declan draws the Guinness and pours shots of fine Irish whiskey nightly. The immaculate facilities and lush, manicured gardens are a testament to their hard work which begins daily before the sun rises lasts until after midnight. Though they are in near constant motion they always take time to be perfect hosts and make their guests feel right at home. Passing through the dining room after completing a few outdoor chores, Declan even made time to indulge this itinerant photographer for a quick portrait session. So, Declan and Breda, I just wanted you to know I haven’t forgotten about you and how much I appreciated your warm hospitality. The prints that I promised to send “someday” are on their way to you. Photographer’s Note: Someday photographs are those that were made after hours while on assignment or simply because I was moved by the spirit at a particular moment in time. Many of them have languished for years as transparencies, negatives and digital files waiting for someday. When possible, I’ve eliminated Saturday from my calendar and Someday is now the day after Friday and before Sunday. All Comments are held for moderation and will not be published until reviewed. All Content © 2000 - 2019 Ed Foster, Jr. All Rights Reserved.